The third edition has been released! Order your copy today. 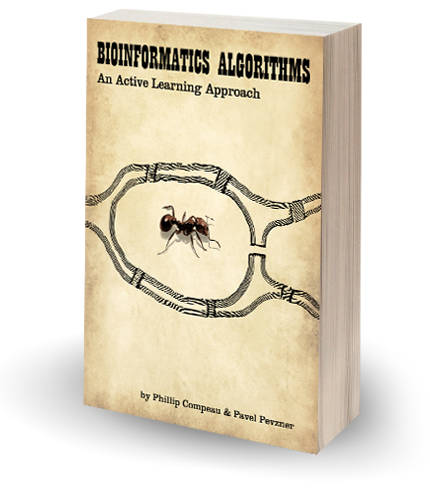 Bioinformatics Algorithms: an Active Learning Approach is one of the first textbooks to emerge from the recent Massive Open Online Course (MOOC) revolution. The bestselling companion to the authors’ acclaimed Bioinformatics Specialization on Coursera, this book presents students with a dynamic, "active learning" approach to learning bioinformatics. Covering fundamental topics in genomics, machine learning, and biological data science, it strikes a unique balance between practical challenges in modern biology and fundamental algorithmic ideas, thus capturing the interest of students of both biology and computer science. Each chapter begins with a central biological question, such as “Are There Fragile Regions in the Human Genome?” or “Which DNA Patterns Play the Role of Molecular Clocks?” and then steadily develops the algorithmic sophistication required to answer this question. Hundreds of exercises are incorporated directly into the text as soon as they are needed; readers can test their knowledge through automated coding challenges on the Rosalind Bioinformatics Textbook Track. This website augments the textbook by providing additional educational materials, including video lectures, FAQs delving deeper into each chapter, and PowerPoint slides. An E-book covering the first two chapters of the book can be purchased from Leanpub.